is a cloud based application that provides integration between SAP CRM and Google email and calendar. G-Connect by iServiceGlobe will improve your productivity and save you time by decreasing the amount of data you have to enter into both SAP CRM and Google. Rather than continually entering prospect/customer data, interactions and activities into CRM, G-Connect by iServiceGlobe will do the work for you. Frustrated that certain emails you send from Google won’t sync to the activity history of SAP CRM? 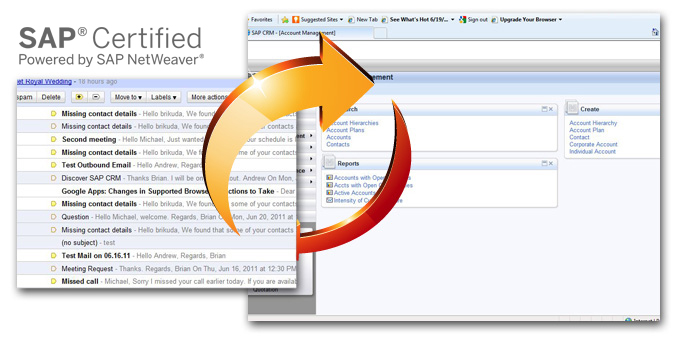 G-Connect by iServiceGlobe eliminates any need for manual data entry into SAP CRM for email related activities. User specified e-mails sent from Google mail will automatically populate in SAP CRM as an outbound e-mail activity. Another added benefit is that e-mail sent from SAP CRM will automatically sync to the “sent” folder your Google mail. Ever miss a meeting because it was added to your SAP CRM Calendar but not in your Google Calendar? G-Connect by iServiceGlobe solves this problem by synchronizing SAP CRM and Google Calendars. Updates, appointments and meetings scheduled in the SAP CRM Calendar will automatically populate the Google Calendar. User specified calendar entries in Google Calendar will populate the SAP CRM Calendar as well. In the field and meet a new prospect? No issues with G-Connect by iServiceGlobe. Enter the prospects name and company into your Google Address Book and the corresponding account and contact will be created within SAP CRM. With G-Connect by iServiceGlobe, you enter the data one time, whether in your Google address book or SAP CRM, and the information will sync.